on the occasion of the official opening of the crossing in 2016. From the early days, Afghanistan has been a tempting vision for railway planners, having at one time been seen as a potential overland route between Europe and India via Russia, avoiding the long sea journey. Termez in Uzbekistan is just a tantalizing 400km (250 miles) from Landi Kotal in Pakistan, near the Khyber Pass. Both these places were rail served by the early part of the 20th century, and as a bonus the proposed line would pass through the Afghan capital of city Kabul. Some major engineering work would be required, including a long tunnel under the Hindu Kush, but nothing that was beyond the technology of the time. But the political situation in Afghanistan during the 19th century and the first decades of the 20th century was volatile, to say the least. There was internal unrest and several periods of open warfare with neighbouring British India. By the 1920s, Afghanistan was a somewhat more stable country, but Russia was now under a communist government that was unlikely to be sympathetic to commercial through traffic between what it saw as imperialist countries. During this period, the Afghan rulers did commission some work to be done on a proposed railway system for internal communications. A German firm was contracted to do various surveys and preliminary work. However, the only railway that was actually built in this period was a 7km, 2ft 6in (762mm) gauge, steam hauled roadside tramway that operated for a few years between Kabul and Darulaman. The locomotives are reported to be still in existence, though in poor condition, at the Kabul museum. In the 1950s several small narrow-gauge industrial railways were opened. Some of these used locomotive haulage, others hand propelled wagons on rails. A couple of hand worked operations survive at coal mines, one of which is reported to have used electric traction at one time. Apart from these lines there was no further railway development until at least the 1960s. The Soviet Union built two rail lines using the Russian standard gauge of 1520mm, to connect their own system with Afghanistan. Both lines crossed the Amu Darya river into Afghanistan itself, but were not extended further. The date of opening of the line to Towraghondi is not known, but probably sometime in the 1960s. The line to Hairatan opened officially in 1982 following completion of the Friendship Bridge the previous year. Both lines fell out of use following the Soviet withdrawal. The Friendship Bridge at Hairatan was reopened in 2001, and that at Towraghondi in 2007. Thus for several years the Afghan railway system consisted of just 0.8 route km of 1520mm gauge track at these two railheads, operated by Uzbekistan Railways at Hairatan and Turkmen Railways at Towraghondi. An extension of the line from the Hairatan railhead to Naiabad, near the city of Mazar-i-Sharif, a distance of about 75km, opened for commercial service in 2012. 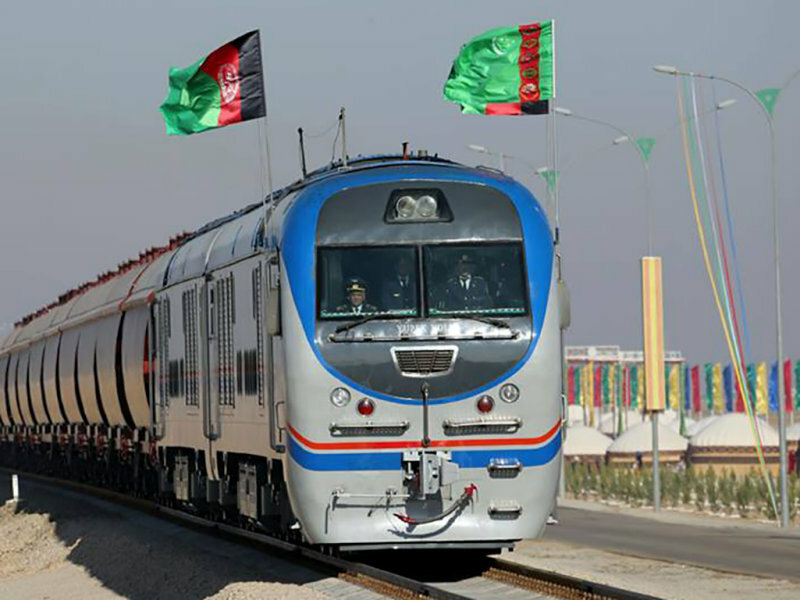 It is operated by Uzbekistan Railways under contract to the Afghan government. A further extension of 657km to Herat is proposed. In 2016, a new link with Turkmen Railways was established with a border crossing at Ymamnazar. The line runs to Akina, about 3km inside Afghanistan. An extension is proposed to Andkhoy, a further 35km. A standard (1435mm) gauge line from Mashhad, Iran to Herat, about 125km of which will be in Afghanistan, is under construction. Construction is expected to start in late 2018 on a new 1520mm gauge cross border link with Tajikistan. A station will be established at Shērkhān Bandar on the Afghan side of the Panj River which forms the border at this point. A rail line will connect with an existing Tajik branch from Kolkhozobod. In Afghanistan extensions are proposed from Shērkhān Bandar to Kunduz (65 km) and eventually to Mazr-i-Sharif connecting with the line from Uzbekistan.